Find artworks, auction results, sale prices and pictures of Giuseppe Bernardino Bison at auctions worldwide. 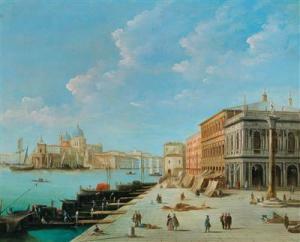 Giuseppe Bernardino Bison (Palmanova 1762-1844 Milan) Venice, The Piazza San Marco; Venice, The Bacino di San Marco, looking East with the Doge's Palace and the Riva degli Schiavoni; Venice, The Riva degli Schiavoni, with the Palazzo della Zecca and the Biblioteca Marciana, the church of Santa Maria della Salute beyond; and Venice, The Grand Canal, looking North, with the Rialto Bridge oil on canvas 10 ¼ x 14 in. (26.1 x 35.6 cm.) 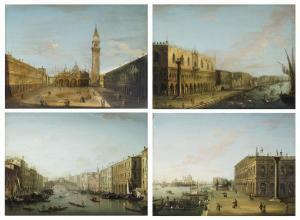 (4)a set of four Provenance North Italian private collection, from whom acquired by the present owner. Bison, Giuseppe Bernardino attr. 1762 Palmanova - 1844 Mailand. Junge Frau mit einem Gefäß am Brunnenrand. Aquarell und braune Tinte auf bräunlichem Papier. Unsign. Verso auf der Rahmenrückwand ein handschriftliches Etikett mit den Angaben zum Werk. Am oberen Rand auf Passepartout montiert. Lichtrandig, leicht fleckig, vereinzelte Knicke. Verso Montierungsreste. H. 29,7, B. 19,8 cm (Blattgröße). Provenienz: Privatsammlung Lörrach. Bison, Giuseppe Bernardino attr. 1762 Palmanova - 1844 Milano. Young woman with a vessel at the edges of a well. Watercolour and brown ink on brownish paper. Unsigned. Verso on the back board a handwritten label with the work's data. Mounted on passepartout at the upper margin. Light-stained, slight stains, isolated creasing. Verso remnants of mounting. H 29,7, W 19,8 cm (sheet). Provenance: Private collection Lörrach. 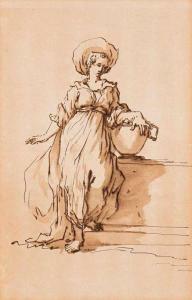 Description: BISON, GIUSEPPE BERNARDINO (Palmanova 1762 - 1844 Milan) The Penitent Magdalene, writing in a book. 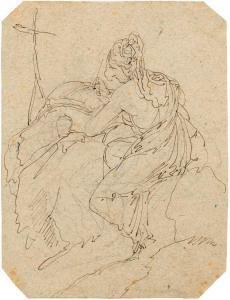 Verso: Study of St. Mary Magdalene. Pen and brown ink over black chalk. 22.3 x 16 cm. Framed. --------------- BISON, GIUSEPPE BERNARDINO (Palmanova 1762 - 1844 Mailand) Die büssende Magdalena, in ein Buch schreibend. Verso: Studie zur heiligen Magadalena. Feder in Braun über schwarzer Kreide. 22,3 x 16 cm. Gerahmt.